The SkipUntil subscribes to the source Observable, but ignores its emissions until such time as a second Observable emits an item, at which point SkipUntil begins to mirror the source Observable. In RxGroovy, this operator is implemented as skipUntil. 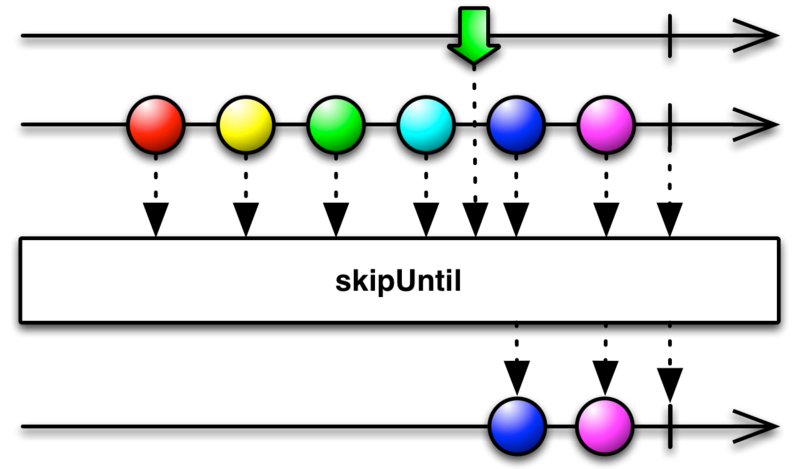 skipUntil does not by default operate on any particular Scheduler. In RxJava, this operator is implemented as skipUntil. RxJS implements the skipUntil operator. You can pass it either an Observable or a Promise that it will monitor for an item that triggers skipUntil to begin mirroring the source Observable. There is also a skipUntilWithTime operator to which you can pass an absolute time or an initial duration in place of an Observable, but this is described on the Skip operator page. RxPHP implements this operator as skipUntil.